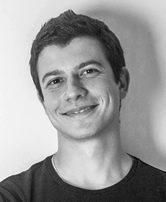 Dominik Cofalka is the founder and managing partner of Mensalia in Austria. He is responsible for the creative concepts for all Mensalia products and the content concepts for public relations and corporate communications. His expertise in "Corporate & Strategic Storytelling" has won several hundred awards. His ultimate goal is always to make the stories behind the key figures visible and visualize business models in strong images understandable. For strategy development or for a change process in corporate communications, he is also available to the top management as a consultant and sparring partner. Dominik has more than 25 years of professional experience as a consultant, publicist and journalist. 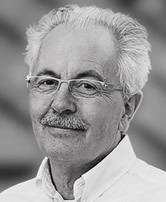 Guido Lombardo is the Founding Partner and Creative Director of Intorno Design. He is a designer and explorer of the area of visual communication and has carried out design projects for a variety of clients across Europe. Possessing over 12 years of experience handling graphic design, branding planning and visual identity ventures, he is also a lecturer of Design Methodology and a Teacher of Technical and Design Drawing within the I Level Course in Graphic Design at the RUFA Academy in Rome. He has also been the Head of the Office for Visual Communication at RUFA since 2013. In addition, Guido is a Senior Member of the Italian Design Association of Visual Communication (AIAP). Reg is based in London and is widely regarded as one of the most experienced figures in global corporate communications. 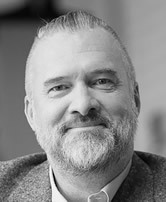 Reg's credentials stem largely from his experience as the founder of Pauffley in 1984 (now Fishburn), which became a major corporate design consultancy within the UK and mainland Europe. Under Reg's direction (1984 to 2001), Pauffley became a reference in the development of global corporate reporting and communications. Clients included many global blue chips and FT European top 300 companies, including Nokia, Electrolux, BP, Credit Suisse, Novartis, BT, Ahold and Aegon. After leaving Pauffley, Reg has continued to advise clients on the strategic direction of corporate reporting. Reg also sits on the judging panel of a number of global corporate reporting award rankings.